Exceptional value is on the cards once again at Montecasino, with the return of the much-loved Night Out For 2 (https://www.tsogosun.com/montecasino/offers/night-out-for-2-2018) package of meals, drinks, entertainment, and movies. Valued at R800, the experience is available at the unbeatable price of R450, offering the opportunity to enjoy a night – or day – out to celebrate, impress a date, or just a well-deserved treat. This ‘not to be missed’ promotion, which comes with a massive saving of R350, runs from 10 September to 30 November. There’s never been a better time to try out one of Montecasino’s new restaurants (https://www.tsogosun.com/montecasino/restaurants-bars), or one of its all-time favourites. Whether you’re in the mood to take your taste buds on a trip to Thailand, Mexico, Portugal or Italy, Night Out For 2 has something for you. Fancy a sundowner in a sports bar, tapas bar, liquid lounge or casino – the choice is yours. But that’s not all… you also get to take in the latest blockbuster, plus show off your bowling or laser tag skills – all for just R450. Dinner options include a main course and dessert for two at either Kai Thai restaurant, the new PortuGalo authentic Portuguese restaurant on the Piazza, La Rosa Mexican Grille and Tequileria, or the Verdicchio Italian restaurant. A variety of cocktails, wines, beers, and even shooters are yours for the taking at the new Texan Wing Bar Restaurant & Sports Bar, the Latin American fusion Lima Tapas Bar, 3Sixty Liquid Lounge, or on the casino floor. The package also includes two 2D movie tickets for Movies@Montecasino, and even more entertainment in the form of 10-pin bowling or laser tag – and each element of the Night Out for 2 experience can be enjoyed on separate occasions or all in the same outing – more choice is yours. 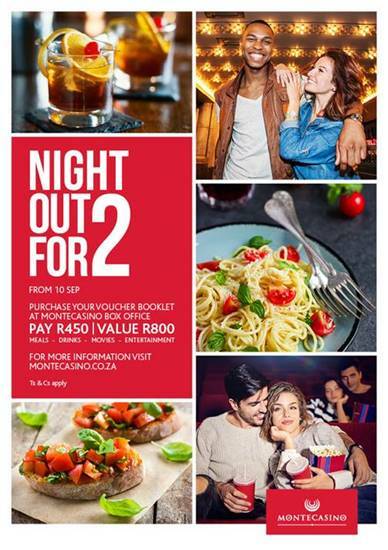 Night out for Two vouchers can be purchased until 10 November and redeemed until 30 November 2018, from the Montecasino Box Office, the Guest Relations Desk, or Mobile Kiosk, and all offers can be redeemed by presenting the respective voucher at the participating outlet. Vouchers can be redeemed on different days. The offers are valid throughout the promotion period, seven days a week, excluding public holidays. For more information, visit www.tsogosun.com/Montecasino.